There’s nothing like satellite pictures of strange structures in the Chinese countryside to spark an online conspiracy debate. News sites all over the web are posting the mysterious pictures and receiving a flood of comment theories on what exactly the structures are. Speculations range from the facetious yet obvious alien crop circles to the more thoughtful atmospheric research stations and bulls eyes for satellite weaponry. Adding to the mystery is the fact that, while the structures are out in the middle of China’s nowhere – across the Gobi desert at the border between Gansu province an Xinjiang – they also just happen to be a mere 100 miles from China’s space program headquarters and launch pads. Technology…conspiracy…the mysterious machinations of a reticent government? Pay attention Dan Brown, I smell an opportunity to make up for The Lost Symbol. The white, zigzagging array that look to some like street maps of Washington D.C. and New York City are “almost certainly” calibration grids for China’s spy satellites. Most likely white paint on the desert ground, the pattern measures approximately 0.65 miles wide by 1.15 miles long. Satellites focus on the grid and orient themselves in space. Wait, China has spy satellites? They do, as do many countries including the US. 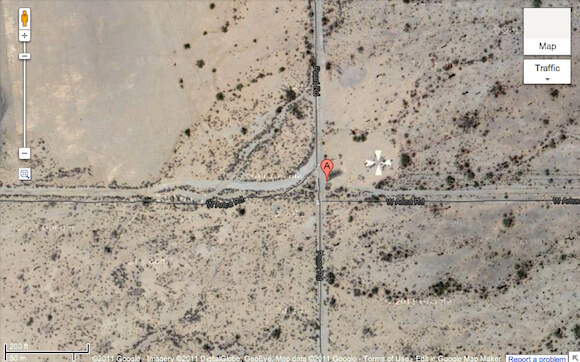 Hill directs us to Casa Grande, AZ, where a white cross was painted on a roadside surface. Painted in the 1960s, the cross was used by the US military to calibrate their Corona spy satellites. While I have no explanations of my own to offer, Hill’s ‘calibrating grid’ hypothesis seems a bit odd. Why paint all those crazy, seemingly random lines? The Corona symbol is less than a hundred feet in diameter. Assuming the optics on Chinese satellites is at least comparable to their US counterparts from the 1960s, they clearly don’t need a mark ten thousand feet long and three thousand feet wide. And if they do, they should probably stop spying. Y Combinator and Gizmodo readers are putting forth a different theory that seems more believable: a ballistics range that mimics the pattern of city streets. Probably the most intriguing of the mystery images is the concentric objects that radiate outward. Three fighter jets at its center are just begging for speculation. Hill is pretty sure that the area is used to both calibrate and to test spy satellite radar. 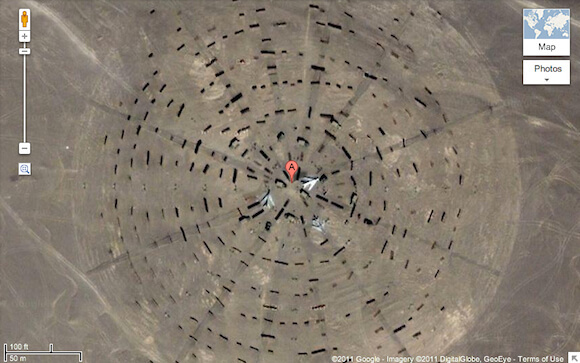 The concentric bumps on the ground are meant to mask the jets by scattering radar. Radar return data from the area would help China to better hide their military operations from the spy satellites of other countries. But don’t take Hill’s word for it. Y Combinator readers have suggested the concentric circles are markers with which to measure the spread and destructive power of bombs. The above image with the bizarrely perfect grid looks like someone dropped a Manhattan street plan in the middle of the desert. Hill says that the lines are in fact most probably roads, but their pattern suggests that they were built to maintain an overhead Yagi antenna. Kind of like one of those old school television antennas that used to give us VHF and UHF – except a lot bigger. A couple miles wide and 15 or so miles long, the antenna is probably used for high-altitude weather tracking and space weather tracking. It’s similar to the SHARE antenna in Antarctica used to observe the electrical fields in the Earth’s ionosphere and magnetosphere. 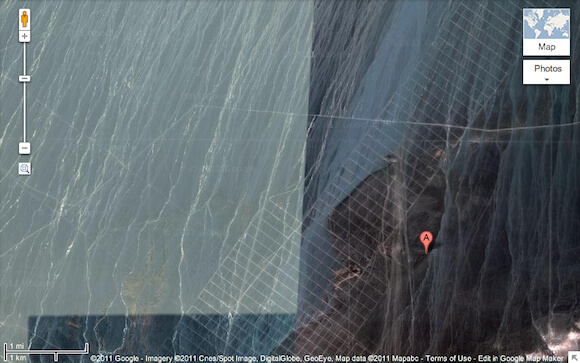 The antenna itself is not visible in the satellite images. The last stop down debunking lane is the four by four grid of square structures, a few of which appear to have been blown to pieces. Hill thinks the area is weapons testing area, a few objects of which have been blown to pieces. Okay, maybe “debunking” was a strong word. The Great Wall of China is the only manmade structure recognizable from space with the naked eye. At least that’s what they used to tell us. But our modern manufacturing capabilities are creating more structures like the one spotted in China that massively demarcate the land. Which is why it’s so fun to fly like superman and virtually tour this great big planet of ours (or the moon, or Mars). 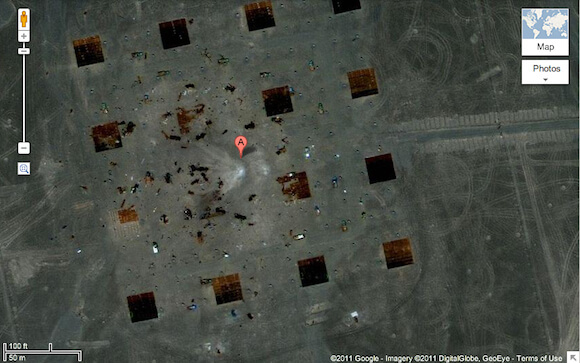 Thank you Google, thank you satellites, thank you Internet. 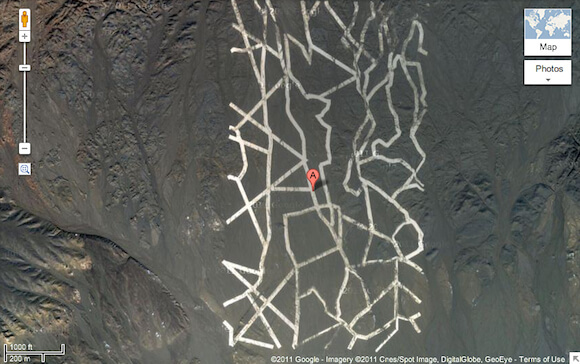 As someone – God knows why – found out by searching the western China desert, the view from space can be a bizarre one. I leave you with this collection of a whole lot more. Bet you can’t explain them all!